The Legion are a predominantly under 20 team, with provision for 8 of the 24-man squad to be Under 23. 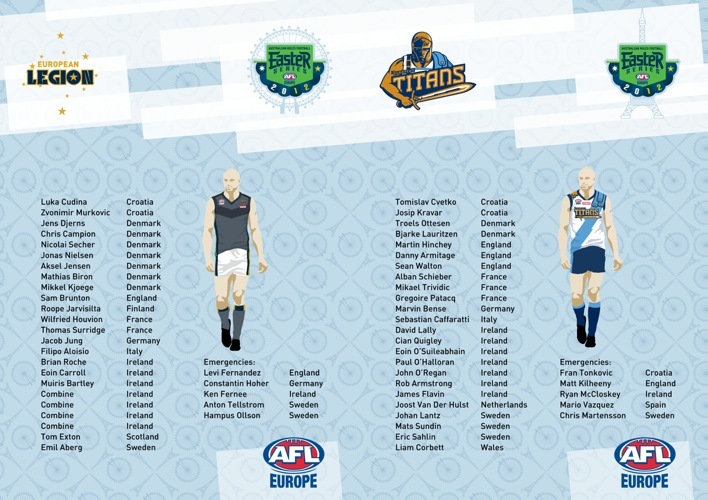 Twelve of the twenty-four members also took the field in 2011's AFL/AIS tour match. Ben McCormack from the AFL Europe says "We are very excited to have players from Italy, Germany and Finland for the first time. Young Italian Filippo Alloisio was voted as player of the 2011 Euro Cup and now gets his chance to impress on the big stage. The selection of 7 Danish players is a testament to their focus on junior development and the blooding of young talent at IC11." Peter Schwab, Tadhg Kennelly and Glenn Lovett are involved in coaching the team, along with Swedish National coach Dan McClaer. The open-age Titans team includes many players with extensive International experience at ICs, Euro Cups and the European Championships. European stalwart Ciaran O'Hara (Ireland) will coach the team, with Troy Pedder (Germany), Armando Colombo (Italy) and Cyril Talon (France) all confirmed as Assistant Coaches. Full squads and schedule below. It's exciting to see these squads named and taking on the young Aussies. Unfortunately just a bit sobering to remember what the other AIS squad (there are two now) did to a (more than) full strength NZ side a few weeks ago. 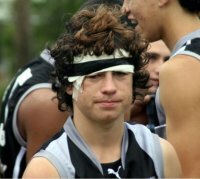 The "kids" are on a par with an SANFL or VFL side. Should be a great experience for Europe though and hopefully we'll steadily see improve over the years. Twelve "nations" represented over the two teams(13 if the spaniard gets a game) is terrific, an indication of the development of the game across Europe maybe??. Players from Italy(league only 3 years old) and Netherlands(effectively about 4-5years old) and the other first timers from Finland and Germany(leagues been around a bit longer) can only be a good thing for footy in Europe. Good to see Croatia represented as well, despite the setback(Hawks and Power forced to merge) in the Croatian league last year. What is the likelihood of the teams reforming as separate entities soon, kolja? Have to agree with both of you, Brett & John, the European teams will struggle to be competitive so experience is what will be gained the most. Let's hope the Legion can be 2-3 goals, at least, closer than they were last year. Will be interesting to see how the Titans' fare. Too big a blow out risk's the exercise not being repeated I would guess. Congratulations to all the players chosen and i would say they will all be giving it their best shot, and let's hope we see two terrific games of footy showcased in Europe. It will be a good experience for the European boys but they wont be competitive. Does anyone know what "combine" means next to the Ireland places? Cheer Cheer the Blue and the White. Few days ago Ireland held a combine for about 15 kids age 17-19 who are prospects in other sports to see if they would be good for footy. They are mainly galic football kids, but few other sports involved as well. Some AFL scouts were there. So those spots are left for the best of those combine kids. Yeah the "combine" is a recent AFL catch phrase, picked up from the US I think, meaning a mini draft camp / testing session. They are starting to stage them all over the world (including Australia), to ID potential talent (both from footy and other sports). They typically then throw a few of the new athletes in at the deep end against the AIS or whoever. Great to see one of these matches being played outside the UK. It can only be a good thing for footy in France especially after France's success at IC11. Keep up the great publicity generated by their success. Still, I think Denmark and/or Germany should have been seriously considered. Denmark being the oldest, non-English speaking league and having a junior program running for many, many years is a MUST for at least one game next year. Germany has been around well over 10 years and I believe their junior program is on the up. Actually, Sweden too are deserving. Lets face it, these matches are(or at least should be)about promoting Aussie Rules just as much as finding potential players for AFL Teams and drawing big crowds of ex-pat Aussies in to watch. Maybe you should run a poll, Brett. Which country/s should get one/each of these matches next year? Would be interesting to see what the European footy community think? Don't want to hijack this thread, but to answer Cam - We are not sure how many teams will play this year as it depends on our recruiting campaigne which will start as soon as the snow melts down. I think Hawks will be restored, but not the Power, VG Bombers are steady with numbers and will be competing, and last years new fount team Zaprudje Giants (GWS sponsored) will compete for the first time in HLAN (Croatian League of Australian Football). There's also Styrian DownUnderDogs from Austria that will compete. So it will be either those 4 clubs in the league or a long shoot one more (Power) if recruiting gets better then expected. Kolja, thanks for the info about your league. Best of luck with the recuiting campaigns, and congrats to the Knights that have made the Legion and Titans teams. Do we know how selection works? Do players have to nominate or be nominated by their country? Is there a selection panel? According to Ben MacCormack, players were nominated in the last squad, but some clubs over exaggerated the talent of their junior players resulting in kids who barely knew the game making the squad ahead of more experienced but less well represented players. Also, many players couldn't make it to the trials- it's not like they're held in every country in Europe. That's why they had the video system this time. Hopefully we'll have our best squad when the Aussie kids come around! We'll at least do better than the Kiwis!! I'm still miffed how Ross Thomson (Scotland Captain) did not make the side? The man is a work horse, he has skills to match any aussie in our league and one of the fitess blokes I know. We had to film a number of players doing various fitness things, like in a draft camp and submit the video.